So back in December I was sent a few recipes to tried out from Chef Fabio Viviani of Top Chef All Stars to help promote the new season. Well, I’m a little late in posting, but I still wanted to share his recipes with you. 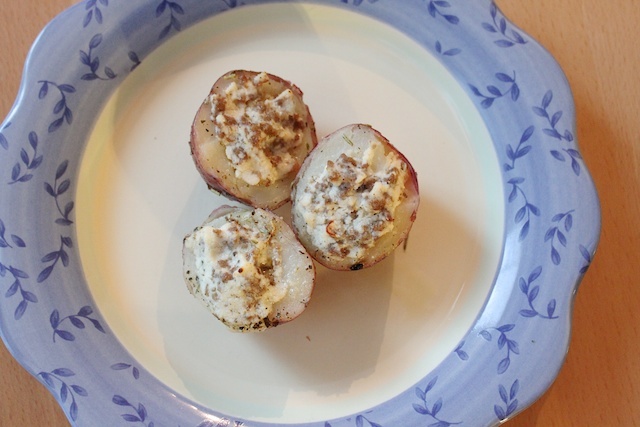 Today is a stuffed potato recipe (photos by me) and tomorrow I will have a dessert also by him. Both recipes using olive oil, so you will sure get your omega-3 in this meal. 1. Preheat oven to 475?F. 2. Boil potatoes for 5 minutes. Cut in half and carve a hole in the flesh to hold filling. In a bowl, toss potatoes with 1 cup Bertolli Classico Olive Oil and herbs. Mix sausage and ricotta. Season, if desired, with salt and freshly ground black pepper. Stuff mixture into potatoes. Bake for 6 minutes. Top with Parmesan. NOTE: If you can’t find cooked sausage, heat 2 Tbsp. Bertolli Classico Olive Oil in a skillet over medium heat and cook raw sausage until no longer pink.